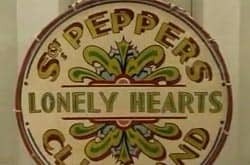 The drum head which appeared on the cover of The Beatles' album Sgt Pepper's Lonely Hearts Club Band has sold for £541,250 ($1.07m), nearly four times the estimated price, at an auction in London. The rock memorabilia sale at Christie's also saw John Lennon's lyrics for Give Peace a Chance sell for £421,250 ($833,000). A pair of tinted prescription sunglasses which John Lennon wore on the cover of the Mind Games single sold for £39,650 ($78,400). The entire collection, which fetched over £1.5m ($2.97m), included a pair of trousers and an amplifier belonging to Jimi Hendrix, a 1967 Gibson guitar formerly owned by The Who's Pete Townshend, and stage clothes worn by Elton John.